SCULPTED MELODY ‘Red Jazz’ by Kati Casida is one of a dozen new works coming to the LBC sculpture garden this month. 'Harmonies' opens on Thursday, Sept. 13, at the Luther Burbank Center for the Arts, 50 Mark West Springs Road, Santa Rosa. 5pm. Free admission. 707.546.3600. There was a moment last October, in the immediate aftermath of the Tubbs fire, that Santa Rosa's Luther Burbank Center for the Arts was thought to have been completely lost to the blaze that destroyed thousands of other homes and businesses. While the center's main theater ultimately survived the disaster and reopened for events within a month, an estimated 30,000 square feet of the campus was destroyed, including the musical-instrument lending library and the outdoor sculpture garden. 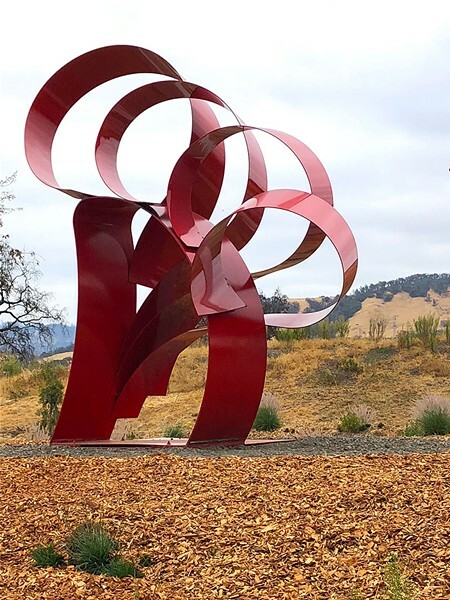 This month, the Luther Burbank Center marks another milestone in its recovery with the reopening of the sculpture garden on Sept. 13 with a new group exhibit, "Harmonies," that features large-scale works from three women artists. Curated by Kate Eilertsen and LBC programming director Anita Wiglesworth, "Harmonies" brings a new lyrical sense of nature, movement and light to the garden, whose landscape was entirely decimated along with many old-growth redwood sculptures by artist Bruce Johnson on display last October. "Women are rarely seen in public art," Eilertsen says. "I proposed that there were several local female artists that deserved to be seen together." Formerly the director of the Sonoma Valley Museum of Art, Eilertsen was approached by the center to curate a show for its garden meant to follow Johnson's exhibit. She and Wiglesworth visited many artists in the Bay Area and ultimately selected Kati Casida, Catherine Daley and Jann Nunn to display in the show. Daley and Nunn are both North Bay residents, and Casida is based in Berkeley. Each artist has four pieces in the show that boast eclectic ideas and materials. "We titled it 'Harmonies' because the sculptures are very different from each other, but they go together very nicely," Eilertsen says. While the show's concept and selection process happened before October's fire, Eilertsen acknowledges that the show has taken on a new meaning over the last 11 months. "It became even more important after the fires to have something lighthearted and beautiful," she says. Scheduled for a two-year run, "Harmonies" invites the public to experience the garden with fresh eyes. "Something that I love about sculpture is that it looks so different as you walk around it," Eilertsen says. "You can see the world in such a different way by looking at the same image from a different angle." All three artists will speak at the opening reception, with food and live music on hand. "It's a chance to meet the artists," Eilertsen says, "and see the center coming back to life."